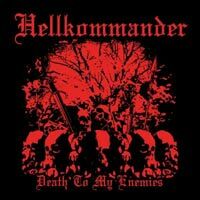 Hellkommander plays metal conceived a million years ago somewhere between Lemmy’s warts and Cronos’ receding hairline. Perhaps there's a touch of Tom G. Warrior's darkness too. It’s dark, heavy and terrifyingly untight rock’n’roll-inspired metal – but, BUT get this; the whole thing sounds as if it was recorded somewhere in the <?xml:namespace prefix = st1 ns = "urn:schemas-microsoft-com:office:smarttags" />UK during the early 80s in a basement with a microphone placed on a couch.